Here is a collage of all the amazing works that were created during our ‘Visions in the Mischtechnik’ Seminar in Torri, Italy during 3 weeks of July 2018. It was a big joy for myself and Kuba Ambrose to co-teach together with Amanda Sage and paint with so many talented artists. It is just miraculous to witness the birth of these wonderful creations, everyone’s dedication and the blossoming of the creative being. Join us for two evenings of creation at House of Alchemy in Brighton, led by international artists Kuba Ambrose and Vera Atlantia. Both beginners and experienced artists are welcome to sign-up to this workshop. In this workshop, we will be synthesising both inner and outer imagery and exploring our visions in paint. You will be instructed step-by-step through a traditional approach to oil painting. By the end of the Intensive two-day workshop, you will take home your unique work of art and an understanding of the painting process. All other materials will be included. (with a 2 weeks break in the middle). Kuba Ambrose and Vera Atlantia will guide students through the planning, drawing and painting stages of Oil & Egg Tempera Painting in the Mischtechnik. During this trimester, we will examine the process of Creation itself, both philosophically and in our own creative process. Utilizing both the tools of the imagination and a keen observation of nature, you will be guided to create your unique work of art. We will learn and apply many of the principles used by artists during the Renaissance period. You will be encouraged to use the creative process as a tool for inner exploration and self-reflection. Paintings have the potential to act as doorways to access higher realms and bring upliftment into our lives. By focusing on the highest vision, we give song to the soul’s aspiration. We will use mantras, devotional singing and meditation to compliment the process of Depicting the Divine and Bringing us together in Oneness. It is our intention to create a sacred space which allows all to flourish in their unique expression. Both beginners and advanced students are welcome! Join us for a fun and creative journey together! This workshop is an opportunity to express your heart and devotion through art. We will create a figurative painting expressing the manifest aspects of the divine. Using oil and egg tempera paints on a wooden panel, we will utilize some of the techniques used during the time of the Renaissance. These images when approached with prayer & devotion can serve as doorways to the Sacred. In the first week we focus on bringing our vision to life, from concept to sketch, to the compositional drawing. We will begin the first painting stages. By the end of the first week we will have completed the dead layer stage of our painting using oils and egg tempera. In the second week we will focus on bringing our paintings to completion in colour, balancing the natural or realistic expression with the supernatural or symbolic elements. We will learn about colour harmony, temperature and symbolism. By the end of the retreat, participants will have explored new approaches to painting, deepened their connection to the sacred and completed their devotional artwork. This workshop honors all paths and sacred traditions. It is our intention to create a sacred space which allows all to flourish in their creative expression. Chanted prayer and silent contemplation will serve to connect us in peace and unity. Both beginners and experienced artists are welcome! Between the first and second week, we will have a short break with an opportunity to visit the “Feest voor Moeder Aarde” (Festival for Mother Earth), a yearly gathering with celebration and ritual for Mother Earth. Earlybird discount: € 895,- + € 75,- for materials if you register AND pay before July 1st 2016. Earlybird discount: € 495,- + € 75,- for materials if you register AND pay before July 1st 2016. Participants will receive a detailed email of what to bring prior to the course. We are looking forward to a fun creative time together! What would Paradise look like? Is it a place or a state of being? 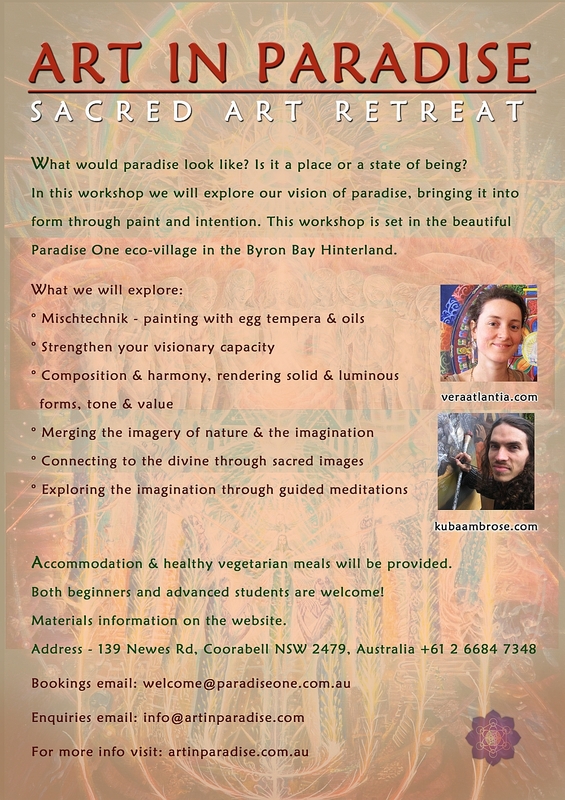 In this workshop we will explore our vision of paradise, bringing it into form through paint and intention. Utilising both the tools of the imagination and a keen observation of nature, you will be guided to create your unique work of art. In participating you will be instructed step by step through a traditional approach to egg tempera and oil painting. Paintings have the potential to act as doorways to access higher realms and uplift our lives. By focusing on the highest vision, we give song to the soul’s aspiration. No previous art experience is required – both beginners and advanced students are welcome! The workshop is set in the lush, picturesque surrounds of the Byron Bay Hinterland, providing plenty of inspiration from the beautiful scenery. Materials for the workshop will be an extra $40 or a list will be posted soon. Our cabins have a queen-sized bedroom and separate living room with a sofa bed. We also have cabins that feature a queen sized bedroom & bunk beds in the living room. There is WiFi around the common areas, but no mobile phone reception on the property. Fly in to Coolangatta (Gold Coast), Ballina, or Brisbane. The earlier you book the cheaper the air fare will be. For airport transfers, www.byronbayairbus.com.au or byronbay.xcede.com.au will bring you to our door, but must be booked in advance. byronbayshuttle.com.au runs regular shuttles to Byron Bay, from where we can pick you up for an extra fee of $40. Renting a car from the airport and returning it to the airport is also a good option. This May 2015 Kuba and Vera will be facilitating two workshops at the Anam Cara Centre in Belgium. Workshops will be in English though translation to Dutch is possible. No previous art experience is required ­ both beginners and advanced students are welcome! This workshop focuses on depicting the inner light of the human energy body. You will be guided in meditation on a visual journey through the chakras to explore the beauty and richness of the inner space. We will be working in the layered approach using acrylic paint. By painting the insights which you discover, you bring a gift to yourselves which can remind you of our deeper nature. If you wish to attend the second workshop on the following weekend from May 9th to 10th, you can reserve your discounted spot for € 395,­ + € 65,­ for both weekend workshops. 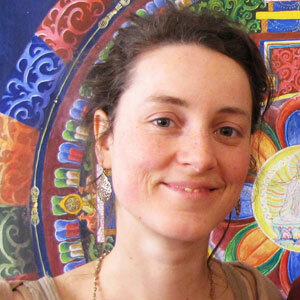 In this workshop you will discover the power of creating art with intention. In meditation you will connect to our highest vision of healing for ourselves and the world. You will work with acrylic paint on prepared panels to create your own devotional artwork. The act of co­creation with source can uplift our spirit and serve as a beacon of hope in today’s world. This workshop honors all paths and sacred traditions. All materials will be included. Optional: bring your own brushes if you wish. Born in 1982 in Melbourne, Australia, Kuba Ambrose is a painter working predominately in the area of visionary/mystic art. Much of Kuba’s art is inspired by dreams and visions as well as seed passages of truth from the various major spiritual traditions. ‘My art is an attempt to unify and harmonize the seemingly opposing forces within, to arrive at a balance and stillness. The paintings are a sort of log book of my inner journeys and of the search for deeper meaning.. Often I’ll begin an artwork with a key phrase or central theme and later that is expanded upon through the play of the imagination’. Kuba studied painting at the Royal Melbourne Institute of Technology and later travelled to Europe to study the technique of oil and egg tempera painting. 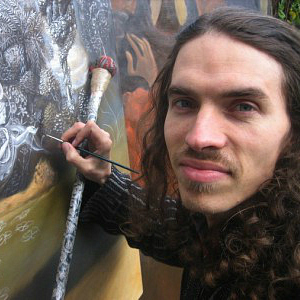 Kuba lives on the outskirts of Vienna, Austria where he currently teaches at the Vienna Academy of Visionary Art. 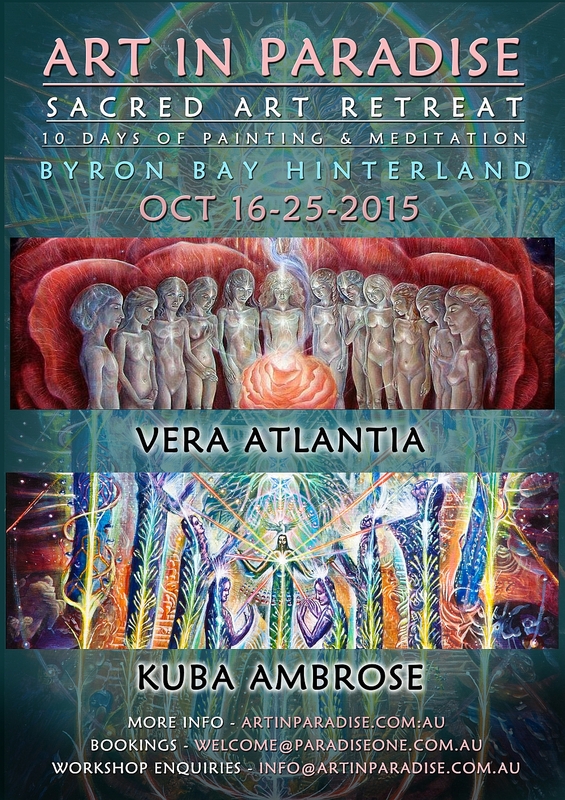 The art of Vera Atlantia reflects our intimate connection to Source and the deepening experience of spiritual awakening. Inspired equally by words and images, this Austrian-born artist has explored both art and writing as a life-long pursuit into self-inquiry, healing and the inner world of the soul. In particular, the vision journey, meditation and writing have led her into deeper dimensions of consciousness and the imagination. Painting became a source of deep inner healing for her, when personal loss revealed art as a tool for transformation. Such healing, she discovered, finds remarkable support through creative expression. These profound experiences lead her to the study of Painting Therapy at the Institut für Mal- und Gestaltungstherapie in Vienna. In 2013, Vera Atlantia has initiated a regular painting workshop called Seelenmaler (Soul Painter) in Vienna, which emphasizes art-making as a tool for self-inquiry and discovery. 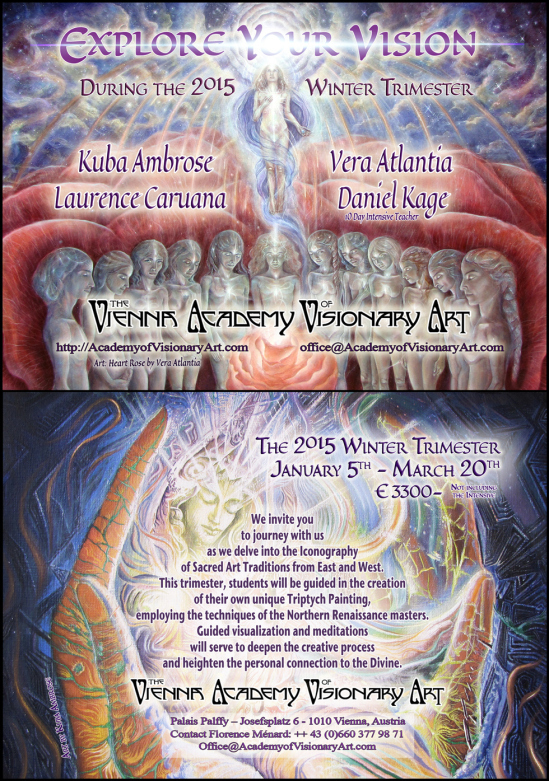 Vera Atlantia is currently teaching at The Vienna Academy of Visionary Art. Bring with you: Lunch, sketchbook for notes and drawings, pencils, and if possible: brushes. > OPEN STUDIO DAYS: After the Chakritecture workshop closes, participants will be given the option to continue working on their artworks during the open studio sessions on monday, tuesday and wednesday. 10am – 6pm. Cost will be 20 euro per day for those wishing to stay on. 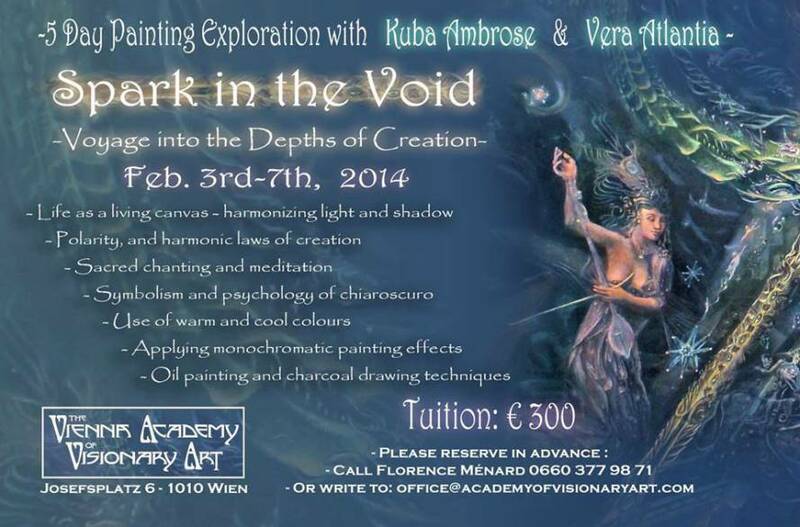 Vera & Kuba will also be painting then and will be available for short instructional questions. These sessions will be mostly self-directed.